I am starting another pair of socks from Cookie A’s book, “Sock Innovation”. Here is the ravelry link to the pattern called Vilai. The stitch pattern is 35 stitches wide by 28 rows. I have to watch the chart as I knit, but it isn’t difficult. 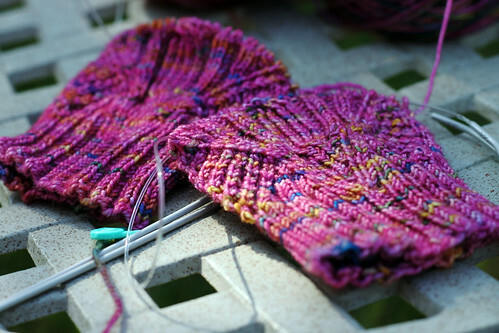 The pattern is rather fun and much more enjoyable than trying to match color changes in the yarn like my last two pairs. There are lots of K3togs and a 7 stitch twisted stitch cable every 14 rows. This entry was posted on Friday, May 29th, 2009 at 3:00 am and is filed under Knitting. Tagged: Knitting, Socks. You can feed this entry. You can leave a response, or trackback from your own site. Beautiful yarn! What is it?